Joo Ji Hoon has renewed his contract with KeyEast! Although Joo Ji Hoon received love calls from multiple agencies due to his success in 2018 with films such as “The Spy Gone North,” “Dark Figure of Crime,” and the “Along with the Gods” series, the actor chose KeyEast as his agency. Joo Ji Hoon made his debut in 2002 as a model and began his acting career in 2006 with “Goong.” He signed with KeyEast in 2011 and appeared in projects such as “Five Fingers,” “Mask,” “Medical Top Team,” and more. The actor recently won a Popular Star award at the 39th Blue Dragon Film Awards and was also nominated for the Best Actor award for his role in “Dark Figure of Crime” and the Best Supporting Actor award for his appearance in “The Spy Gone North.” He also received Best Supporting Actor awards for his role in “The Spy Gone North” at the 38th Korean Association of Film Critics Awards, 27th Buil Film Awards, and The Seoul Awards. The actor will be busy in 2019 as well, with Netflix original drama “Kingdom” premiering in January and MBC’s upcoming Monday-Tuesday drama “Item” airing shortly after as well. KeyEast currently houses Son Hyun Joo, Jung Ryeo Won, Son Dam Bi, So Yi Hyun, In Gyo Jin, Kim Hyun Joong, Kim Soo Hyun, Kim Dong Wook, Woo Do Hwan, and others. Zombie drama, Kingdom, dropped a teaser and we see Joo Ji Hoon as the maligned crown prince who is deemed a traitor after the supposedly dead king comes back to life. The drama also stars bigwigs Ryu Seung Ryong and Bae Doo Na. The series will screen on Netflix next year and a second season is in the pipeline. Ju Ji Hoon will remain under KeyEast! South Korean actor Ju Ji Hoon does not have plans to leave his current agency, KeyEast, as he decided to renew his contract even before its expiration. The acclaimed actor, who has fostered a successful acting career through the years, re-signed with the agency who also houses Kim Soo Hyun, Kim Hyun Joong, Woo Do Hwan, Jung Ryeo Won, Moon Ga Young, and more A-list actors. Hong Min Ki, the vice president of KeyEast’s management division, confirmed that Ju renewed his contract with the agency who has been handling his affairs since 2011. Hong also expressed his gratitude to the actor for trusting them once again. “Ju Ji Hoon, who has been with KeyEast since 2011, has been willing to renew his contract before it expires. I am grateful to Ju’s faith and determination to work with us,” Hong said. Additionally, he promised that the agency will give its utmost support for the activities of the actor. “As a partner who knows each other better than anyone else, we will support each other for mutual success,” he said. Ju first signed with KeyEast in January of 2011, months ahead of his military discharge in November of that year. His comeback project and his first acting project under his then-new agency was the period comedy movie I Am King where he played the dual role of Deok Chil and the Grand Prince Choong Nyung. Since then, the actor has curated an impressive list of successful films and drama projects. including the box-office series Along with the Gods. In 2019, he will return with a new drama titled Kingdom which is produced by Netflix. Additionally, he is also set to star in Item, a fantasy legal drama which will air on MBC. 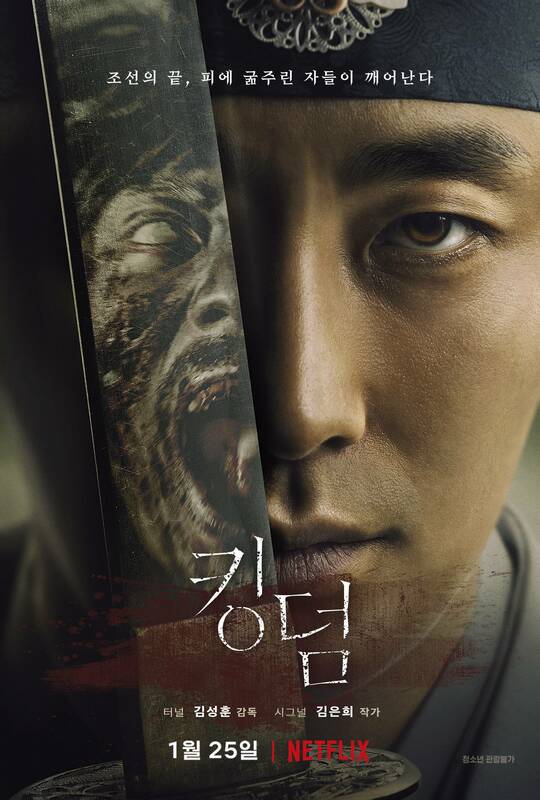 You need a pretty exciting poster for a project as big as Netflix's upcoming zombie-themed sageuk "Kingdom", and I'd say Joo Ji-hoon as a Crown Prince one blade slice away from a zom zom would be it. The show's poster makes the proximity of the undead menace crystal clear. Kim Eun-hee-I's ("Signal", "Three Days") latest is a short and sweet 6-part drama, and it looks like it's a promising one, as it has already been renewed for a second season. We won't have to wait long to dig in, as the first season will be premiering at the end of January. Not much is out in terms of promotional photo and video goodies yet, but some stills and a teaser should give your excitement a nice boost, along with the poster. Its tagline reads "At the end of Joseon, those hungry for blood have awakened". Flail to rotting glory, oh shuffling ones. Upcoming MBC drama “Item” has revealed a new teaser with Joo Ji Hoon, promising an action-packed blockbuster drama. “Item” is a fantasy drama about a man and a woman who possess the supernatural ability to uncover intrigue and secrecy surrounding everyday items. Joo Ji Hoon plays Kang Gon, a prosecutor filled with passion for justice. The drama is based on a popular webtoon of the same name. In the released teaser, scenes of a church, metal grates, and a bloody document meld together. Joo Ji Hoon narrates, “Unbelievable things are happening to us right now,” as he wakes up in a subway car on its side, with people hanging on side railings for their lives. “Item” will be directed by producing director Kim Sung Wook, who co-directed “Goodbye Mr. Black” and play “House, Mate.” It will be written by Jung Yi Do, who previously wrote OCN’s “Save Me.” The drama is slated to air next February. *** I'm waiting for this! *** Both movie and TV actors gathered on December 17 to receive awards in conjunction to South Korea’s Day of Consumer Rights. Thank you for all the updates @willenette. *** I'm happy for JJH that he's back in dramaland this year with (2) upcoming dramas in a row. The new year is starting off with some exciting drama premieres! There are plenty of great actors, thrilling plots, and more to come, and it looks like we’re in for lots of romance, suspense, fun, and intrigue in 2019. Check out what dramas are coming up in the first half of the year below! This zombie historical drama penned by “Signal” and “Ghost” writer Kim Eun Hee is based on her 2014 webtoon series “Land of the Gods.” The story focuses on a Joseon era crown prince investigating a mysterious epidemic that threatens the entire country. “Kingdom” premieres on Netflix on January 25. Two people whose fates are intertwined attempt to solve a mystery behind items with supernatural powers. “The Item” will premiere in February on MBC, and it will be available on Viki. MBC has released a special teaser for its upcoming Monday-Tuesday fantasy drama “Item”! The 40-second long teaser features the drama’s main leads Joo Ji Hoon, Jin Se Yeon, and Kim Kang Woo and introduces their characters. Based on a popular webtoon, “Item” tells the story of a prosecutor named Kang Gon (Joo Ji Hoon) and a police profiler named Shin So Young (Jin Se Yeon) who work together to uncover the secrets behind a number of objects that hold special protective powers. Kim Kang Woo plays the role of the villain Jo Jae Hwang, a young innovative businessman who is secretly a sociopath. The trailer features many scenes with powerful special effects and ends with a powerful narration: “Bear this in mind because this just the beginning.” Even though it is less than a minute long, this action-packed teaser is definitely raising the excitement towards 2019’s first fantasy K-drama! *** This is definitely JJH's year - Joo Ji Hoon currently has two upcoming dramas ahead of him. I read that he might be reuniting with Ha Jung Woo his co-star in "Along with the Gods" in a new film! A source from Key East Entertainment reported that Joo Ji Hoon is currently reviewing the offer to appear in the upcoming film titled, ‘Kidnapping’. The upcoming film will be based on the true story of the kidnapping of a diplomat in Beirut, Lebanon in 1986. Ha Jung Woo reportedly made the recommendation to cast Joo Ji Hoon. In case he'll take the offer, “Kidnapping” will begin filming in the latter half of this year. In the meantime, can't wait for these (2) dramas soon. I just saw an article about it. Joo Ji Hoon and Ha Jung Woo might be reuniting in a new film! “Kidnapping” is a new film directed by Kim Sung Hoon who is known for directing the 2016 film “Tunnel.” The upcoming film will be based on the true story of the kidnapping of a diplomat in Beirut, Lebanon in 1986. If Joo Ji Hoon accepts the role, he will be reuniting with his “Along with the Gods” co-star Ha Jung Woo. Ha Jung Woo reportedly made the recommendation to cast Joo Ji Hoon. “Kidnapping” will begin filming in the latter half of 2019. Joo Ji Hoon currently has the premieres of the two dramas “Kingdom” and “The Item” ahead of him. Hi irilight, thanks for sharing this here. Just as its first season is gearing up for its global launch on January 25, the Korean Netflix Original series Kingdom is already getting ready to go back into production on its second season, which will begin shooting in February and is expected to continue until June of this year. The period horror-thriller stars RYU Seung-ryong, BAE Doo-na and JU Ji-hoon. Adapted from the webcomic ‘Land of the Gods’ by KIM Eun-hee, the star TV drama writer who also serves as showrunner here, Kingdom is directed by KIM Seong-hun, known for A Hard Day (2014) and Tunnel (2016). During Korea’s Joseon Era, strange rumors concerning the king spread around the land, while the crown prince emerges as the kingdom’s only hope against a plague that is turning people into violent killers. A representative of the series related that the principal actors were already confirmed for a second season while shooting the first six-episode season last year. Netflix CEO Reed HASTINGS announced the second season during the global streaming platform’s recent showcase in Singapore, explaining how rare it is to greenlight a second season of a program ahead of its first season’s premiere. RYU Seung-ryong of Miracle in Cell No.7 (2013) and Roaring Currents (2014) stars along with BAE Doo-na of The Host (2006) and Cloud Atlas and JU Ji-hoon, recently seen in both Along with the Gods films and The Spy Gone North (2018). It has been 13 years since the modern royal romance story of Princess Hours. Ju Ji Hoon and Yoon Eun Hye’s love pairing in Princess Hours was a mega hit when it aired in 2006. Even BIGBANG’s G-Dragon followed it closely as mentioned by Seungri in a guesting at KBS variety show Happy Together. Princess Hours pictures an endearing princess story that it’s not surprising how it has spawned early generations of avid K-Drama fans like me. To help out in the financial crisis of her family, Shin Chae Gyung, a typical high school girl succumbs to an arranged marriage with Korea’s modern time Crown Prince. Lee Shin who was rejected when he proposed to his girlfriend Min Hyo Rin agreed to the marriage talk, which originated from his late grandfather’s wish to marry his descendant to the descendant of a palace worker who saved his life. That person turned out to be Chae Gyung’s grandfather. On their wedding day, Hyo Rin tries to reach her ballerina dream, then changes her intention and realizes too late that she wants Lee Shin more than anything in her life. Chae Gyung enters the Palace and proceeds with her princess training, while she often bickers with Lee Shin. Eventually though and without realizing it, she soon finds herself falling in love with him. But she tries to restrict her emotions because she knows that Shin seemingly has not gotten over his first love Hyo Rin. To complicate the love picture, Prince Shin’s cousin – Prince Yul returns to Korea, and eventually grows fond of the princess as well. If not for his father’s death, he was supposed to become the Crown Prince. Eventually love genuinely develops from an initially arranged marriage between Chae Gyung and Shin. But Yul’s greedy mother throws in setbacks to challenge Shin’s position, hence affecting the princess who wants to support her prince. Crown Prince Lee Shin and Crown Princess Chae Gyung’s love story is the typical I-was-not-meaning-to-fall-for-you-but-I-fall-anyway romance. You will love how the marriage for convenience and ancestor’s promise to marry their future descendants pave the way to one of Korea’s most endeared romance tales of young love. Modernizing the usual Royal Family’s internal power struggle as its main driving conflict, the romance prospered for the couple who had difficulty admitting their true feelings. Threading on a smooth love progression, the narrative draws its addictive hook from how the love begins from nothing at all to I-want-you-to be-always-beside-me kind of adoration. Shin and Chae Gyung, portrayed by Ju Ji Hoon and Yoon Eun Hye respectively, made their characters evolve as the romance between them escalated steadily. The heartfelt lines were superbly delivered, and left the viewers feeling the pain and the bliss of the moment. Superbly delivered heartfelt lines and saccharine scenes abound Princess Hours. It plays with the viewers’ emotions through its depiction of relationship inhibitions. At the same time, it captures blissful frames of realizing mutually exchanged love by the drama’s main couple. In my case, Princess Hours is part of my all-time favorites. A drama I watch traditionally, that I know which episodes house the poignant and sweetest scenes. To this date, I still smile at those memorable moments of Shin and Chae Gyung. The scene when Shin subconsciously realizes he has fallen in love with Chae Gyung. The scene when the pranks they both played backfire at each other cutely. The scene when they play as a normal couple for a weekend getaway. The scene when Shin has a long night while his princess sleeps soundly. The scene when all the fans watching want to have that back hug and couch sweet moment too. One of the few dramas with amazing music setlist, Princess Hours popularized lingering songs that fit in perfectly to the defining moments of the series. Featuring ballads from Howl, Shim Tae Yoon, and more, the drama’s OST roster rings a bell easily when you chance upon its melodies. Why you should not miss Princess Hours? My pillows suffered a lot of strangulation on the emotional and heart fluttering scenes while watching before. Luckily, I’ve become less tamed with my more recent reruns. Sprinkled with melodramatic tones, the lead girl’s vibrant presence and the hero’s quirky surprising humor neutralize the heavy layers of the plot. Princess Hours is one youth drama you should never miss it, for it is one of the K-Dramaland’s staple classics. *** Finally.......... he will be making his small-screen comeback through this upcoming drama. Joo Ji Hoon will play the role of Kang Gon, a just prosecutor who goes against a direct over from his superiors and reports an internal corruption. He said that the character got him interested because he seems like a responsible person. He said the drama has a lot to offer with a fresh topic and visual effects. These are the reasons why he chose this drama for his comeback. “The Item” will premiere on February 11 at 10 p.m. KST, and it will also be available on Viki! *** JJH's drama "Kingdom" is premiering this week. Reasons to watch: Set sometime during the Joseon dynasty, after the king is suddenly struck ill with a mysterious disease, Joo Ji-hoon’s crown prince finds himself the target of Ryu Seung-ryong’s political machinations. Desperate to learn what is at the heart of his father’s illness, Joo Ji-hoon soon discovers that it’s not just his own life at stake–the fate of Joseon hangs in the balance. Bae Doo-na is the skilled and brave doctor who becomes a stalwart ally to the crown prince. Kingdom marks Netflix’s first step into original K-dramas, and judging from the teasers and stills that have been released, Netflix was not about to coast on star power alone. Fun fact, Kim Eun-hee wrote both the drama’s script, and the original web comic that Kingdom is based on. The first Korean drama series produced by Netflix is due to be released around the world this week. A press event for the series was held in Seoul on Monday before it goes to air on Friday for 139 million subscribers in 190 countries. Set during the Chosun Dynasty, the six-episode zombie drama revolves around a doomed crown prince who investigates a mysterious epidemic. The series stars Bae Doo-na, Ju Ji-hoon and Ryu Seung-ryong. It is directed by Kim Seong-hun, who directed the 2016 film "Tunnel," and written by Kim Eun-hee, who scripted the hit TV series "Signal." Netflix has been increasingly involved in Korean entertainment productions to expand its presence in Asia, where Korean films and TV series and shows are popular. It made a huge investment in director Bong Joon-ho’s 2016 film "Okja," and produced the first entertainment show "Busted! I Know Who You Are" last year. It also cooperated with leading management agency YG Entertainment to air a YG-produced sitcom starring Seung-ri of boy band Big Bang. Ryu Seung-ryong (left), Bae Doo-na (center) and Ju Ji-hoon pose at a press event for their new Netflix series in Seoul on Monday. With "Kingdom," its aim seems to be to lure more Western viewers by incorporating a zombie theme familiar to them. The cast said they were excited to be starring in a series airing on the world's leading streaming service. "We are all actually new faces [to global Netflix viewers] except for Doo-na, who is already recognized for her roles in Netflix's TV series," like "Sense 8," Ju said. "I'm really excited that viewers across the world will watch it." "Making a six-episode drama was new for me, as I had only worked on two-hour film projects. I tried to keep in mind how people from different cultures would respond to it," the director said.